Please be sure to read the etiquette page here. You will be entering a place that adheres to Japanese discipline. You may also print a PDF here for your reference. Please arrive 15 minutes early so you can meet the instructor, and sign the “Assumption of Risk” waiver form. Wear loose, comfortable clothing that you can move in easily, with pants that reach below your knees (to protect your knees from mat burn). Both men and ladies change rooms are available. If there is extra time before class starts, you can do any warm-up or stretching that you like. 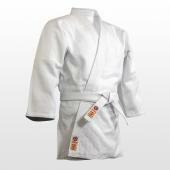 If you register for lessons, you are expected to purchase a Gi (training uniform) within two weeks of starting your lessons. Please see the instructor for details and pricing. Please come to the dojo with a clean body and clean breath. Please also keep fingernails and toenails trimmed for the safety of your training partners. The same ideas hold for the clothes in which you train: They should be clean, free from unpleasant odors, and in good repair. It is a good idea to take a pair of flip-flops or slip-on’s with you to wear from the changing rooms to the training area. 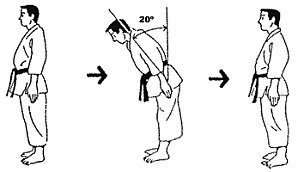 Please do a standing bow towards the shomen (the front of the class) whenever you enter or leave the dojo. This is a sign of respect for your fellow members and the dojo. When class is about to begin, students sit in seiza (kneeling) in a line facing the shomen (the display on one wall of the practice area). The instructor leads the class in bowing towards the shomen. Then the instructor and the class bow to one another, saying “o-ne-gae-shi-ma-su“, which means roughly “will you teach me please.” Our Japanese audio pronunciation guide can be found here. The instructor or a senior student usually leads the class in warm-up exercises called aikitaiso. These usually take about 15 minutes, and are designed to do a full stretch of legs, arms, neck, fingers, joints as well as to relax the body before class. You will be expected to eventually know and count in Japanese from 1 to 10. Please listen to the following clip. In a beginning class, you will be assigned to a senior student to practice a basic back fall which involves going down to one knee and rolling backward. This helps you to learn how to take falls safely. You will also begin to learn forwards and backwards rolls. Beginning classes do not include techniques that require forward rolls, but we practice rolling so that you will be able to take those falls later as you progress in your practice. We roll on soft mats. The choice and order of activities in the class are up to the instructor, except that “bowing in” always signals the start of the class, and “bowing out” signals the end. Most of the class is devoted to practicing a few particular Aikido techniques. Usually in beginning classes, the “attack” is a static grab or hold, which is simpler to deal with than a strike. Techniques are practiced much more slowly than “real time”, so that you can learn each of the movements. Emphasis is placed on staying relaxed throughout the movement, and being aware of your own and your partner’s energy. As you become more familiar with the movements, the pace will increase, and you will progress to working with a partner approaching to grab or strike. Typically, the instructor demonstrates a technique or a movement, and then the class splits into pairs or small groups to practice what was demonstrated. Partners take turns in the roles of attacker (”uke”) and defender (”nage”). Both roles are equally important, and the goal is to maintain awareness and relaxation at all times. After the instructor has finished demonstrating, repeat the name of the technique loudly, then say “o-ne-gae-shi-ma-su” (”Please”) to the instructor. When the instructor claps, this signals the end of that partner practice. Both you and your partner should thank each other by sitting in seiza (kneeling) and then bowing to each other. Say “a-ri-ga-tou go-za-i-ma-shi-ta” which means “thank you”. Sit to the side in seiza or cross-legged for the next demonstration. Our audio pronunciation guide can be found here. The instructor may take a few minutes at the beginning or end of class for “ki breathing”, which is a controlled breathing practice that helps develop one point and coordination of mind and body. He will say “mokusou” to signal this. Sitting in a relaxed, centered posture (usually seiza), you take long, slow breaths, in through the nose and out through the mouth (with a slightly audible “ha” sound). This is a calming session lasting just a few minutes or less. At the end of class, the instructor leads the students in bowing towards the shomen (the front of the class). Then, the instructor and the class bow to one another. It is traditional to say “dou-mo a-ri-ga-tou go-za-i-ma-shi-ta” or “Thank you very much” when bowing to the instructor at the end of class to show your appreciation. Finally, each member of the class bows to and thanks every other member for their contribution to the class. All members help to put away the mats. Follow senior students because the mats are put away in a particular way to keep them clean. Sign the attendance sheet even if it is your first class. To become a member, please consider registering for seasonal classes. Aikido is a Budo (martial art) created by Morihei Ueshiba. After the Founder’s passing in 1969, his son Kisshomaru Ueshiba was inaugurated as Aikido Doshu. At present, Moriteru Ueshiba, grandson of the Founder, has succeeded his father as Aikido Doshu. The Aikikai Foundation, officially recognized by the Japanese government in 1940, was founded in order to preserve and promote the ideals of the true Aikido created by the Founder. As the Aikido World Headquarters, it is the parent organization for the development and expansion of Aikido throughout the world.